Vastex International has introduced a new low cost F-1000 Flash Cure Unit with a 2600-watt/240V, 46 x 46 cm infrared heater that reduces flash cure times by 33 percent. “The upgrade from 1950 to 2600 watts on the 240V unit offers hotter, faster flashing for the same price,” says Mark Vasilantone, president. The high-density medium-wavelength infrared heater features closely spaced coils which eliminate cold spots and under-curing associated with conventional infrared heaters, and carries a 15-year warranty. Built-in heat shields on four sides of the enclosure allow positioning the unit closer to the garment, improving edge-to-edge temperature uniformity and increasing efficiency. The F-1000 unit is also available in a 120V, 1950 watt model for low-to medium-capacity applications. 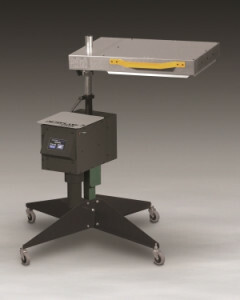 All F-1000 Flash Cure units are equipped as standard with a head leveler to adjust the heater parallel to the pallet; extra-large side handles; heat control with power lights; and a sturdy, four-leg stand with castors and vertical adjustment collar allowing 360° rotation. Power plug options include NEMA 5-20P, NEMA 6-15P or international plugs. An optional Rotary Table with two vented steel pallets allows the F-1000 unit to double as a low cost dryer. Also optional is an Auto-Flash upgrade (120 or 240V) with HMI controls that rotates the head into place above the pallet with the touch of a foot pedal, and automatically rotates the head away from the pallet after a user-adjustable dwell time has elapsed, to prevent over-flashing and under-flashing of garments.